There'll soon be a lot more of me! "Squid, octopus and cuttlefish populations are booming across the world. These fast-growing, adaptable creatures are perfectly equipped to exploit the gaps left by extreme climate changes and overfishing, according to a study colleagues and I published in the journal Current Biology..."
"...Everywhere we looked we found a substantial and statistically significant increase. Bottom-dwelling octopus and cuttlefish who live relatively static lives are thriving, as are squid that hover over the bottom, along with those in the open ocean that may travel thousands of kilometres from spawning to feeding sites. At a time when life in the oceans is threatened, cephalopods seem able to buck the trend..."
"Scientists say they have discovered what might be a new species of octopus while searching the Pacific Ocean floor near the Hawaiian Islands. 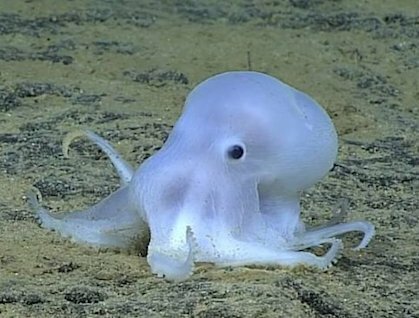 On 27 February, a team found a small light-coloured octopus at a depth of about 2.5 miles..."
"...Michael Vecchione of the National Oceanic and Atmospheric Administration, said the discovery was made near Necker Island. 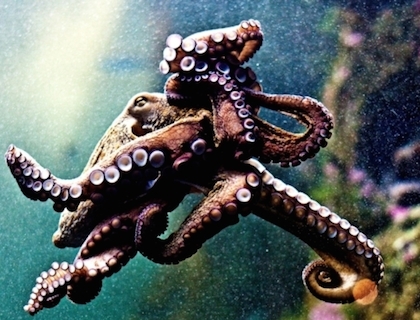 The octopus did not have fins and all of its suckers were in one row on each arm, Vecchione said..."
"'...It is almost certainly an undescribed species ...,' he said..."
"It was an audacious nighttime escape. After busting through an enclosure, the nimble contortionist appears to have quietly crossed the floor, slithered through a narrow drain hole about six inches in diameter and jumped into the sea. Then he disappeared..."
"...This was no Houdini, but rather a common New Zealand octopus called Inky, about the size of a soccer ball..."
"...octopuses, members of a class of marine animals including squid and cuttlefish called Cephalopoda, have shown themselves to be adept at escaping through spaces as small as a coin..."
A short article about octopuses, as well as numerous videos of octopuses in action and links to other National Geographic entries about fellow cephalopods, such as squid and cuttlefish. 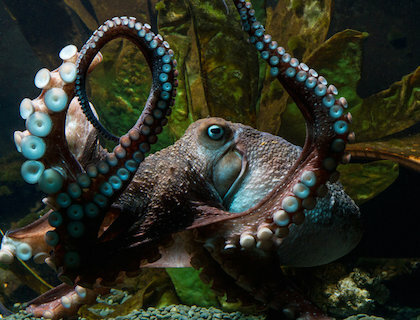 Ten curious facts about octopuses, regarding their biology, evolution, and relationship with humankind. An ongoing exhibit about cephalopods, including - of course - octopuses, such as the Giant Pacific Octopus, and the astounding Mimic Octopus. For those 21 and up and in the vicinity of Seattle, an Octopus-themed bar exists for your octopodal imbibing needs. And, since this is Portland, you have to mention something about tattoos, right? Found at the associated links above. 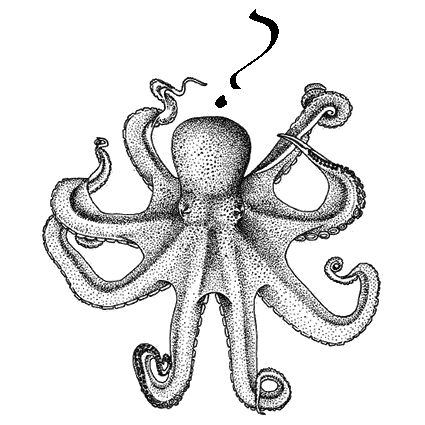 How do You Fish for Octopus? Usually with pots, similar to those used to catch crabs, lobster, and shrimp. In fact, octopuses are frequently found in traps meant to catch crustaceans, lured in by the prospect of an easy meal. Most octopus fishing takes place off the coasts of Japan, Korea, and northeast China and Russia, although the Atlantic octopus fishing industry is growing, particularly off the west African shore. Octopus fishing is considered something of a sport in various parts of the world, where divers, typically armed only with a knife, root out octopuses from their hiding places, dodging jets of ink in pursuit of their eight-armed prize. This PDF, available for free download from Alaska Sea Grant, a division of NOAA, serves as a guide to anyone interested in commercial octopus fishing.